FROM HAUPTMANC TO THE TRIPPLE BRIDGE! 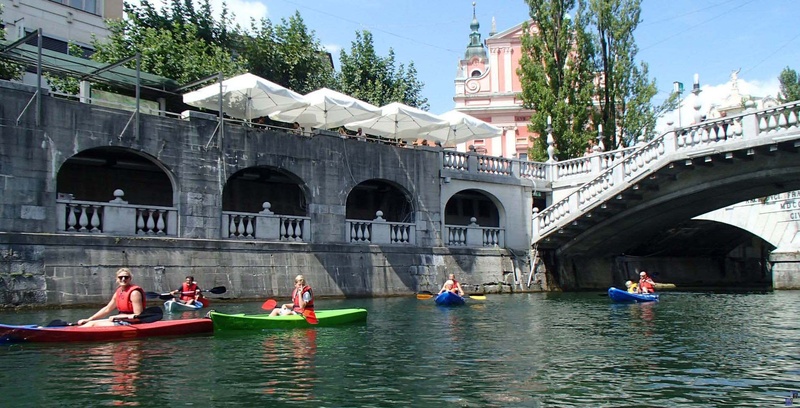 Join us for rowing on the river of seven names (Ljubljanica) and Iščica to learn the basics of rowing. The beauty of wilderness at the threshold of civilization will discover the river itself. Rowing is like a safari where you can observe wild fauna and flora in, on and along the river. You can take a bath in the river; you will not be the first! Only a few steps from the last city streets in the capital city of Slovenia - Ljubljana there is the moor named Ljubljansko barje. Around 150 km2 marsh plain is marked by an endless patchwork of meadows, fields, hedgerows, ditches and creek. Surrounded by motorways Ljubljansko barje in rushing traveller leaves no special interest. And what may be so special in the province at the edge of the capital city and have a name associated with the marshes? But anyone who will explore the way inside will be pleasantly surprised. It is filled with songs of birds, buzzing insects, frogs and the calls of slow moving gently murmuring water. The wheels of daily life here stop. For all rowing tours we recommend light clothing and footwear appropriate to the season, swimwear, in hot weather crème or spray for protection against insects, the head cover, dry clothes and shoes, at least 1 litre of water, light gloves and a towel. Keep the mobile phone and valuables in a waterproof bag. Respect the nature and other visitors. Location: The River Iščica from the bridge in Hauptmance and the river Ljubljanica to Triple Bridge, end at Livada. A transfer to and from your starting point we can arrange per request (extra charge) – reservation must be made in advance. To return to the city centre it is also possible to take a walk all along the river Ljubljanica (1 km). Price includes: seat boat, paddle, life jackets, general liability insurance and English speaking guide. All participants must know how to swim.